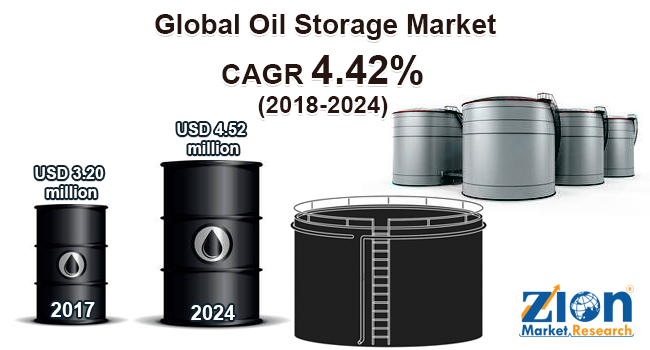 Global oil storage market expected to generate revenue of around USD 4.52 million by the end of 2024, growing at a CAGR of around 4.42% between 2018 and 2024. On the basis of the reserve, the oil storage market is bifurcated into strategic and commercial. In 2017, strategic petroleum reserve accounted for approximately 60% of the oil storage market across the globe. The report covers forecast and analysis for the oil storage market on a global and regional level. The study provides historical data from 2015 to 2017 along with a forecast from 2018 to 2024 based on revenue (USD Million). The study includes drivers and restraints for the oil storage system market along with the impact they have on the demand over the forecast period. Additionally, the report includes the study of opportunities available in the oil storage system market on a global level. In order to give the users of this report a comprehensive view of the oil storage market, we have included competitive landscape and analysis of Porter’s Five Forces model for the market. The study encompasses a market attractiveness analysis, wherein the reserve, product, and the storage segments are benchmarked based on their market size, growth rate, and general attractiveness. The report provides company market share analysis in order to give a broader overview of the key players in the market. In addition, the report also covers key strategic developments of the market including acquisitions & mergers, new technology launch, agreements, partnerships, collaborations & joint ventures, research & development, technology and regional expansion of major participants involved in the market on the global and regional basis. Moreover, the study covers price trend analysis, technology portfolio of various companies according to the region. The study provides a decisive view of the oil storage market by segmenting the market based on reserve, product, storage, and regions. All the segments have been analyzed based on present and future trends and the market is estimated from 2018 to 2024. The regional segmentation includes the historic and forecast demand for North America, Europe, Asia Pacific, Latin America, and the Middle East & Africa. This segmentation includes demand for oil storage market based on all segments in all the regions and countries. Some of the leading key players that have upheld the oil storage market are ZCL Composites, Columbian Steel Tank, Containment Solutions, Belco Manufacturing Company, Sunoco Logistics, Oiltanking GmbH, Synalloy Corporation, Oiltanking GmbH, Red Ewald, Poly Processing, L.F. Manufacturing. While some of the other major players contributing their efforts in the oil storage market include Ziemann Holvrieka GmbH, Marquard & Bahls, Snyder Industries, Royal Vopak N.V, and Tuffa Tank.